Your guests most likely ask you similar questions prior to their arrival: where to pick up keys to their room/apartment, who will be waiting for them, want to organise an airport transfer, which restaurants do you recommend, or do you offer additional services (excursions etc). To save you time on writing and sending this type of emails we’ve created automated and personalised e-mail templates. For example, now you can send automated emails 3 days prior to arrival with information about check-in time and location, how to easily find your property or where to park. You can also create e-mail templates that will be sent 1 day after arrival and will include important information about your surroundings - recommended restaurants, excursions, “must see” sights etc. 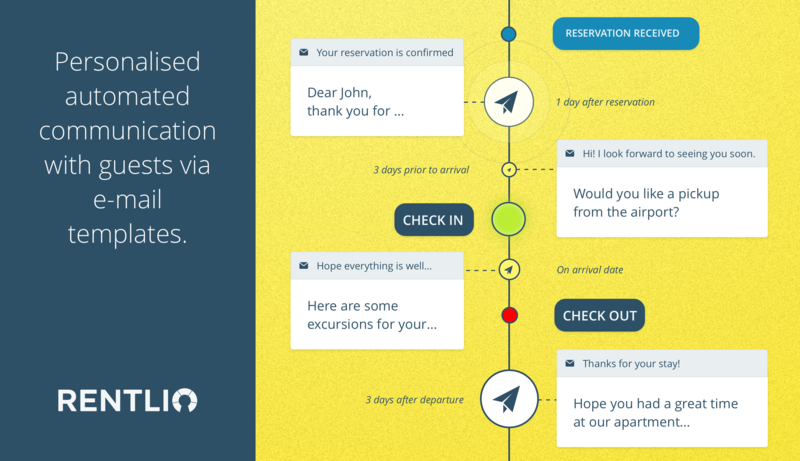 The goal of Rentlio e-mail templates is to automate communication with guests which will save you time and improve your business. Also, e-mail templates can be personalised by using guest data received in reservations. By doing so each template can start with the guest’s name, contain the name of the channel where they made the reservation or similar. Read our instructions on how to create e-mail templates.